The majority of food is wasted in our homes. We buy too much because it’s "on sale", and then forget about it in the back of the fridge. We aren’t really sure what use by dates really mean so we throw it out to be safe. But a lot of the time, food goes bad because it isn’t stored properly. It can be confusing at the start, but once you know what to do it doesn’t take a lot of time to make a big difference. Roots with vegetables like shallots, sweet potatoes, squash, garlic, potatoes and onions should be stored in a cool dry place, away from sunlight. Keep onions separated from potatoes as they will cause eyes to sprout. The best places to store root vegetables are under the sink or in a pantry cupboard in perforated paper bags. Broccoli, cauliflower and leafy greens should be kept in perforated bags in the refrigerator's crisper, While peppers, celery, cucumber, green beans and zucchini prefer airtight bags. Mushrooms keep well in a brown paper lunch bag in the fridge or cool, dark place to avoid moisture build up. Tomatoes ripen best at room temperature, and then can be refrigerated to maintain their freshness. In the land of fruit, the rules are more relaxed. Fruits can be left on the counter for easy access, or be in the fridge for long term storage. Apples and oranges are very resilient and can sit out for up to a week in good condition. Generally it’s nice to have a couple at room temperature for easy snacking and leave the rest in the fridge. Berries are notorious for getting squishy really quickly so try rinsing them in a mix of 1 part vinegar to 5 parts water and storing in a partially open paper towel lined container in the fridge. This helps prevent bacteria growth and can extend their life to over a week. Perfectly ripe bananas are a unique thing, so when it hits the sweet spot, refrigerate them to slow down the ripening. They will continue to taste the same, even if the skin darkens. Bananas can be good tools as well since they give off ethylene gas which causes other fruit to ripen, so when you have that stubborn avocado, throw it in a paper lunch bag with a banana. They say that one bad apple spoils the bunch, and it’s actually true. If mold is growing on just one fruit, it will spread to its neighbours quickly. Check through your produce drawer often to catch that bad apple before it’s too late. In a similar vein, cleaning your fridge frequently can eliminate any mold that is hanging around. Ice cube trays are super handy to freeze leftover tomato sauce, pesto or other sauces. When it’s solid, transfer to a freezer bag and then just defrost the exact amount you need. Chop up fresh herbs before they go bad and put in ice cube trays with olive oil to use as the base of dish. (This works best with rosemary, sage, thyme and oregano). 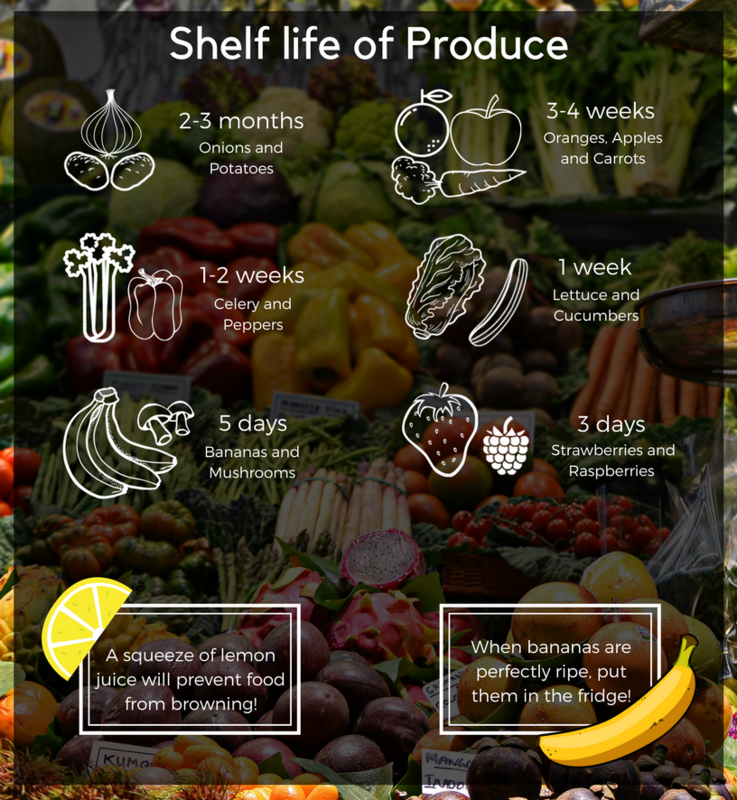 Here's a handy chart to refer to whenever you need to figure out how long your fruits and veggies last (under proper storage) for optimum freshness and no waste. Get your very own fruits and veggies that are a little misshapen but still fresh and beautiful on the inside, delivered straight to your door. Check it out here.